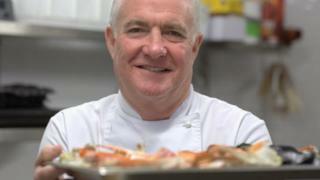 TV chef and restaurateur Rick Stein has warned of a domestic crab shortage due to rising demand from China. Last year the Chinese bought £17m of crab from the UK, double the amount on the year before, according to HMRC. Stein, whose establishments include the Seafood Restaurant in Padstow, Cornwall, said: "There's very little crab around. For a couple of months there was virtually none." He added the "affluent middle classes" in China were driving the demand. Crab fisherman Johnny Murt said: "We've been told that the end user in China is paying £21 per kilo, which is an incredible price. If we get £3 per kilo we're happy." Many of the crabs are caught off Cornwall and Devon and kept alive for the 11-hour flight to China. Dawn Spencer, co-director of Bluewater Seafood Company in Paignton, Devon, told BBC Inside Out South West there was uncertainty over the Chinese market but the company had been depending on it. She said: "We find our orders from China are going up all the time and there seems to be an insatiable appetite. Without our China export, without a doubt this would have been a very difficult year for us." Her company is currently sending two and a half tonnes of live crabs to east Asia every week. In 2015 a temporary ban on importing crab was imposed by Chinese authorities because of metals being detected, prompting fears the market could be closed down at short notice. There is also uncertainty surrounding the market as a result of the UK's imminent departure from the European Union. Stein, who was awarded a CBE in the 2018 Queen's New Year's Honours List for services to the economy, said he hoped to continue selling crab in his restaurants but warned: "I do think people are going to have to get used to paying a lot more for it."